Zoe Watson (centre) and members of the Friends of Mareham Pastures. There is a call for locally based conservation groups to team up, pooling volunteer manpower and resources. After 13 years as secretary and then chairman of the Friends of Mareham Pastures Local Nature Reserve in Sleaford, Zoe Watson has stepped down having moved to live in Helpringham, replaced by interim chairman Mark Suffield. But with this changing of the guard for the reserve, comes a new focus to sustain the future of conservation volunteering around the town. Group secretary Kathy Blythe said: “We would like to set up a volunteering resource for Sleaford. “We have a solid core group of around a dozen volunteers that always come and support our events but we would always welcome more to help keep the place how we all love it. Mrs Blythe said local groups such as the Lollycocks Field nature reserve volunteers, the Slea Rivercare clean up group, Lincolnshire Rivers Trust and the Sleaford Navigation Trust, all have resources that could be combined as a pool of manpower and equipment. Visit the group’s website at www.marehampastures.co.uk. The Friends were busy putting up bird boxes on Sunday for the British Trust for Ornithology Bird Box week. 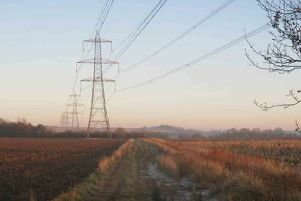 Matthew Davey, the county council’s Environment and Community Projects Officer, said Mareham Pastures was by far the most popular site he oversees. He said of Mrs Watson: “Over the last 12 years, without Zoe’s ideas, energy and organisational skills we would not have achieved half as much as we all have. She also secured numerous grants which helped pay for sculptures, seating and events.